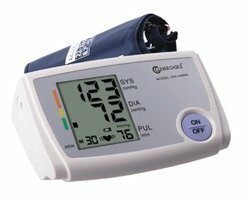 Clever Choice Automatic Upper Arm Blood Pressure Monitor. Large and clear LCD display. Memory can store 30 Measurements. Operates on 4 “AA” Batteries (Not Included).